An oil painting by Pieter Brueghel displaying the Crucifixion of Jesus Christ in between the two theives. Crucifixion is the execution of a person by nailing or binding them to a cross." The main purpose was to provide a particularly painful, gruesome public death using any methods that are most expedient for that goal. In fact, crucifixion is one of the most effective slow and painful execution methods, versus hanging from hooks, burning at the stake or fighting wild beasts. It is a very brutal torture method used on the "worst" of people that people categorize. 1 What Countries Practiced Crucifixion? Felix Beato an Italian photographer captured a photograph of Sokichi who was sentenced crucifixion, because he murdered his master and it was considered as a serious crime that deserves the most extreme penalty. Right away when you hear crucifixion you may think of Jesus or the Roman practice. But if you look deeper into it, it wasn't just the Romans who crucified people. Besides the Romans there were many of crucifixions carried out by Japan, Burma and Europe and even Islamic countries. Crucifixion type methods still being used by radical Islam groups. Burma: Many crucifixions took place during the process of the construction of the Burma railway. For example Felix Carey, a missionary witnessed men being murdered and crucified. Japan: Crucifixion was used in Japan during the "Sengoku" period, after a 350-year period with no capital punishment. It is believed to be suggested to the Japanese by the introduction of Christianity into the area. Although similar types of punishments had been used as early as the "Kamakura" period. Islam: Even the Qur'an mentions Crucifixion being used In Surah 7:124.
position of crucifixion with the chest and arms spread out. There are many attributing factors to death on the cross since not all crucifixions were carried out the same. When the whole body weight is supported by the stretched arms, the cause of death is asphyxiation. Its said that the victim would have severe difficulty inhaling, due to the chest muscles and lungs being spread out. The victim would then have to pull his weight up by his arms leading to exhaustion. When they cant lift himself, the victim would die within a few minutes. There have been many tests done to see that when your arms are stretched out in certain positions it inhibits being able to breathe properly. 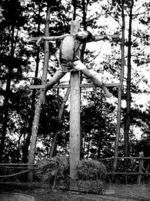 There are quite a few historically popular crucifixions carried out. Here are a few notable cases where people or masses where crucified as martyrs. 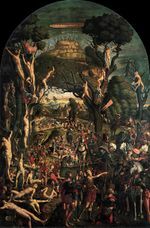 Twenty-six Martyrs of Japan- missionaries successfully converted approximately 300,000 Japanese to Christianity in 1597. But the Japanese government did not like it so they fired back crucifying Twenty-six Japanese Christians in Nagasaki, who were later said to be martyrs by the Catholic Church. The Ten Thousand Martyrs- This mass crucifixion took place around 9th-century b.c. 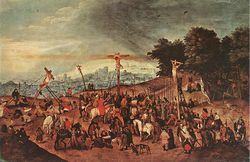 This mass crucifixion involved ten thousand Roman soldiers who converted to Christianity then where all crucified on Mt. Ararat. Third Servile War- also referred to by The Gladiator War or The War of Spartacus, this war was caused by the uprising of the slaves against their Roman masters. When the rebellion led by Spartacus and other gladiators were finally crushed, the roman politician Marcus Licinius Crassus captured 6000 remaining rebellious slaves and had them crucified, their bodies hanging on crosses along the road to Rome. Saint Peter the Apostle- Peter the next down for the church after Jesus was said to be crucified by Emperor Nero in Rome in 1st century CE. Peter requested to be hung upside down because he believed he was not worthy enough to be crucified like Jesus. Jesus Christ- Probably the most known Crucifixion for being the backbone of Christianity. Jesus, also Gods son was crucified by the Romans for no wrong doing. ↑ Gee, Alison. Crucifixion from ancient Rome to modern Syria BBC News. Published 8 May 2014. This page was last modified on 23 January 2017, at 12:27.